The business world evolves and changes constantly. For a business to survive today, it needs effective leadership; to flourish, it must have creative, innovative leaders at every level. The qualities of leadership are no longer a 'bonus,' nice when you find someone who has them. They are the qualities that are necessary in every employee if your business is to advance in the complicated, competitive economy of the 21st century. Your organization cannot depend on hiring leaders. You must develop them, and you need a complete, integrated process to do so. Too often leadership development focuses on one skill, attribute or facet of leadership, believing that developing a single quality will work. Trying to develop leaders this way is like trying to become a professional golfer by only practicing your putting. The best golfers are total golfers—they excel at driving, approach shots, sand shots, pitching, chipping and putting. They also must possess the confidence and mental strength to perform in the heat of competition. The same is true for leaders. The best leaders, Total Leaders, excel at all parts and facets of leadership. 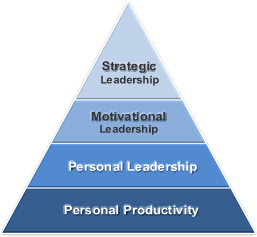 As you can see, the Total Leader Concept is a thorough, comprehensive, complete, whole leadership development process. It literally develops people into Total Leaders! It’s difficult to imagine that a top leader in an organization could really be effective if they were missing one or more of these key components. Many leaders today are frustrated because they haven’t had the opportunity to develop all four areas.